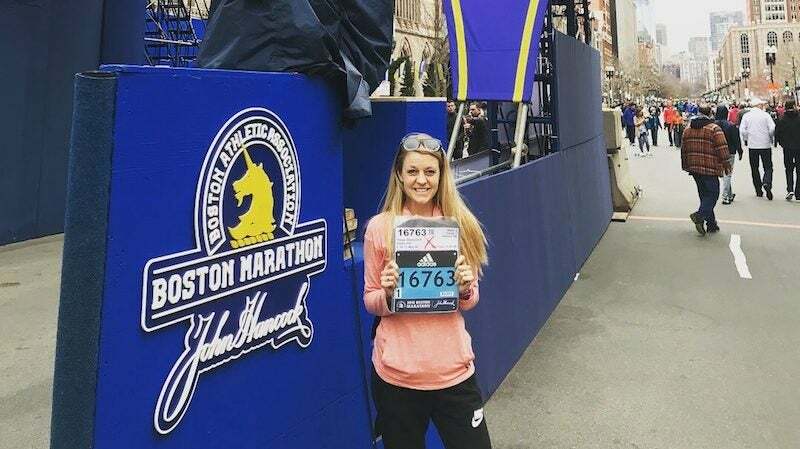 I woke up on Monday, April 16 to the coldest Boston Marathon race conditions in 30 years, with temperatures in the mid-30s, wind gusts up to 25 miles per hour and steady rainfall, ranging from a slight drizzle to a downright monsoon. Luckily, I had a reserved spot on a charter bus, which shuttled me from downtown Boston to Athlete’s Village in Hopkinton. On the bus from 6 to 10 a.m., I eagerly waited with some of my former Fleet Feet Chicago Race teammates. Safe from the howling wind and relentless rain, our spirits were high as we chatted about the course and our training cycles. As our wave start times drew nearer, departing the bus became imminent, and a palpable wave of trepidation swept through the air. 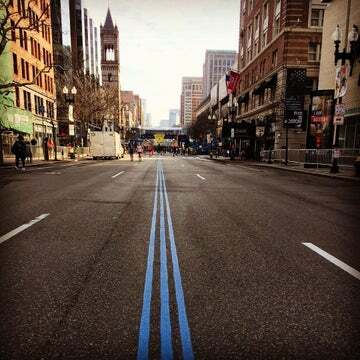 It felt as though we were going off to battle, a 26.2-mile fight through the elements to Boston. To equip ourselves for the venture, everyone offered one another supplies. Ponchos, plastic bags, tissues, arm warmers, vaseline—these were the tools that we armed ourselves with to brave the conditions. When it was my time to walk the mile to the start, I left our safe oasis with two girls who were also in my wave. Even though we had just met, we became fast friends as we huddled together while edging our way to the start. Shielded from the elements by a trash bag and heat blanket, I distracted myself by observing the outfits of the other runners. There was a woman wearing swim goggles, people donning shower caps, many with plastic bags on their feet and still others who chose to run in their ponchos. Despite the electric crowd support, I found it difficult to get into a good rhythm during the first few miles. Because I started so much later than I was slated to, I spent the early part of the race weaving in and out of other runners, trying to avoid puddles and struggling to get into a good cadence. 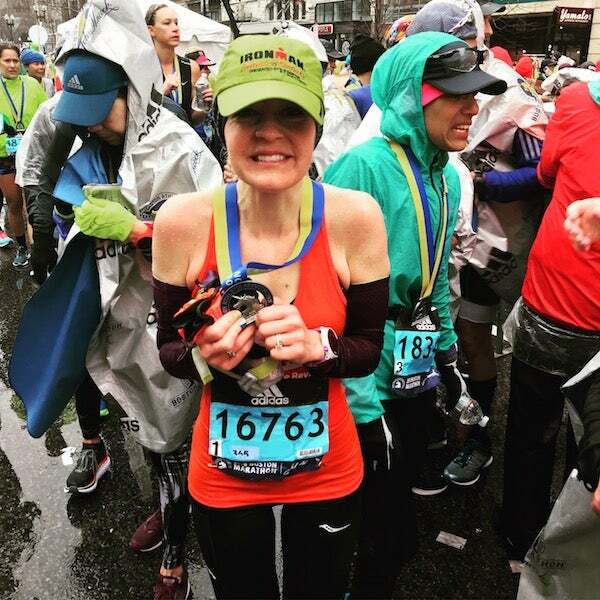 Instead of letting this frustrate me, I chose to focus on the positives, particularly on how grateful I was to be completing the Boston Marathon. I also decided to mentally break the race into manageable chunks. I told myself that I only had to run two 8-mile segments, then I would see my husband Matt and his parents, run the Newton Hills, see Matt again and finally complete a few, easy miles to the finish. I flew through the first 23 miles, with a smile plastered on my face. My plan to enjoy the race and soak it all in was going perfectly. However, I had seriously underestimated those last few “easy miles.” The final 3 miles ended up being the most challenging part of the entire day for me. As I got closer and closer to Boston, it became colder and windier. All of the elements finally sunk in, and my energy started to fade. Eventually I completely tuned out the race, course and spectators. 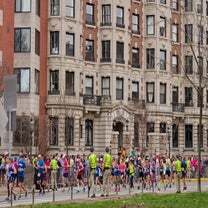 As I made a right on Hereford Street and prepared for the final stretch on Boylston, I desperately tried to muster energy to sprint to the finish. Instead, my body was completely spent, and that final mile was my slowest. I crossed the finish line, with barely enough energy to lift my arms up into the air. Although I did not achieve my A, B, or C goal time, I did obtain something much greater. I learned that I am capable of completing a tough marathon course in even tougher conditions, while staying mentally positive for (almost) all of it. I also secured another Boston qualifying time, thus ensuring that I can have another go at this course next year.